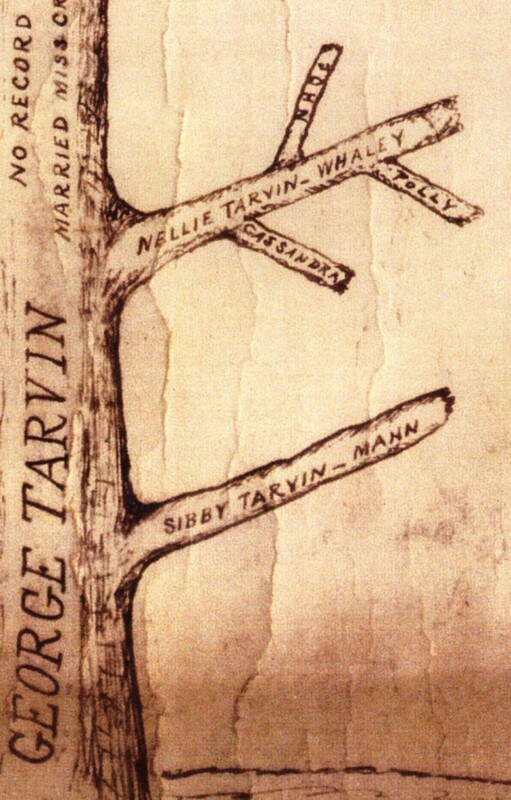 The earliest Tarvin genealogy, the tree drawn by Richard J. Tarvin in 1897, shows a small branch coming from Rev. 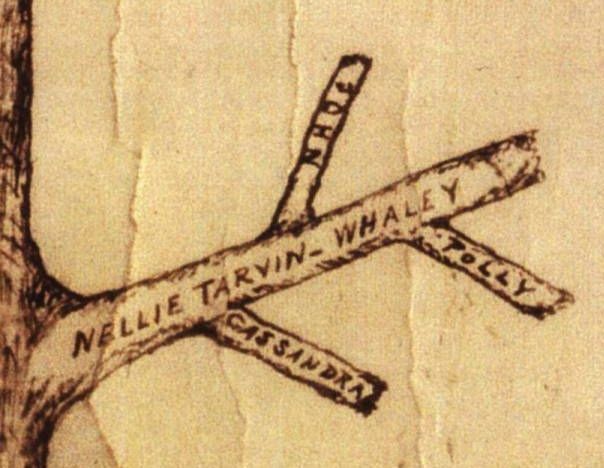 George Tarvin that says "Nellie Tarvin - Whaley" and from that radiate three twigs, labeled "Cassandra," "John," and "Polly." ) For many years, that's all that was known of the Rev. George's daughter who was named Eleanor after her grandmother, Eleanor Mudd. Later compilers showed "HMR Whaley" as the husband of Nellie/Eleanor. However, no one with these initials has been found. It has now been suggested that these initials should read "A Mr. Whaley." If so, then we shouldn't be looking at all for someone with the initials "HMR," but rather for a suitable man named Whaley. But who can that be? First, we need to decide where to look. It is fairly certain that Rev. George's family moved from western Virginia to Kentucky in late 1794. At that time, we believe that of Rev. George's children, only Thomas, born 1768, was married. He had married Deborah Flora in 1788. As the second child of the family -- and the oldest daughter -- Nellie's estimated birthyear is 1770, making her 24 at the time of the migration. She could surely have married before the move. On the other hand, our records show that her children were not born until 1800, indicating a marriage perhaps as late as 1798 or 1799. (At that time, couples seldom postponed the birth of their first child after marrying.) Let us look in both regions. Virginia possibilities: In the Hampshire County area where Nellie grew up, there are no Whaley families listed in land records, state censuses of 1782 and 1784, or will before 1800. However, an interesting name shows up in a land transaction that must be mentioned. In 1794, Luke Hass (this surname is also spelled Haas, Haaz, Horse, or House) transferred 75 acres of land to Abraham Hass. The lease and release was witnessed by William Twilly, Elisha Cowgill, Angus McDonald, George Tarvin, and William Wheeley. (See Sage and Jones, p 24.) This last person was not named again anywhere in the county records. This is one of the documents that proves a close affinity between George Tarvin and other Dunkers inasmuch as the Haas family was a noted Dunker family. It also shows a relationship with Elisha Cowgill, two of whose children married two of Rev. George's children after their relocation to Kentucky. But as to the relationship to William Wheeley, that is still unknown. Looking in other counties, we find what looks like a John Whaley in Campbell County beginning in about 1813. As reported by Dan W. Olds (see http://freepages.genealogy.rootsweb.com/~dano/whaley.pdf), the Tax Lists of Campbell Co., Kentucky, showed a John Whany/Whary/Wherry between 1813 and 1818. Then, in 1818 both John Wherry and Nelly Whalley are listed. Tax lists from 1820 to 1833 show Andrew Woods and John Whaley with no land but often listed consecutively. If Eleanor's son, John Whaley, married in 1819, that would explain his name as a head of household. Eleanor's name, Nellie, would appear only if she were head of household; that is, if her husband had died. Dan Olds is interested in Andrew Woods because Nellie's daughter Cassandra married an Andrew Woods in 1817. 1820 U.S. Census of Campbell Co., Kentucky, page 14 shows: WHALEY, Ellender and WHALEY, John, probably mother and son, each a head of household. By then, it seems, "Mr. Whaley" had died. We are seeking additional clues to this mystery. Update 18 May 2006: Correspondence from Chris Roberts points out that the 1810 Census shows that Eleanor Tarvin Whaley was living next door to Rev. George Tarvin in Bracken Co., Kentucky. Since she is listed in that census, her husband must have already died. Her household includes one young male and three young females. According to the Tarvin Tree, Eleanor's children were John, Cassandra, and Polly, born between 1800 and 1804. Recall that Cassandra grew up to marry an Andrew Wood or Woods in 1817. This Andrew Wood is quite prominent in the area, serving as bondsman in the record of several family marriages. He was bondsman for John Whaley's marriage to Sarah Phelps 20 Jul 1819 and for George Stern and Deborah Whaley 24 Apr 1829. In that union, he gave an oath that Deborah was "... raised by him from her childhood, her mother Sarah Shanks having agreed to the same...."
Identifying this Sarah Phelps may give us additional clues to the Tarvin-Whaley connection. A Sarah Whaley married 1819 William Shanks in Campbell Co., Kentucky, with a John Whaley as bondsman. Perhaps Sarah was the other daughter in Eleanor's household in 1810, giving sense to the notion that John Whaley, Eleanor's son, would serve as bondsman at her wedding. However, the Tarvin tradition does not see a daughter of Eleanor's named Sarah or Sally. Looking at the dates of these reported events, Doborah Whaley marrying in 1829 means she was born around 1812, assuming the bride's age of 17. This is before her mother, Sarah Whaley, married William Shanks in 1819. If Sarah had had Deborah out of wedlock, at, say age 15 to 17, Sarah must have been born around 1795 to 1797. The Rosenberg book lists a Sarah Whaley born 1795 to the John Whaley noted above, settler of Whaley Station, but that Sarah apparently married 17 Aug 1810 James Beckett Nichols and had five children from 1816 through 1840, all in Mason Co., Kentucky. Ergo, this is not the right Sarah Whaley.